Wars have a way of never ending. Long after the weapons have been dropped, the wounds in society continue to fester for decades. The waves of war ripple throughout time, and each war feels like it happens in the wake of the last one, part of some endless continuum of brutality. And as you stumble bleary eyed through the visual mortars set off in this show of art made after World War One, you realise the wounds still haven't healed. It begins with bloodied, solitary grimness during the war itself. 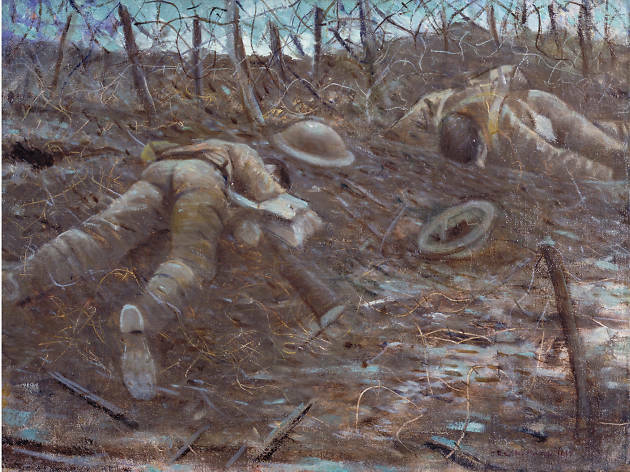 A body hangs off a tree stump, corpses litter fields – the war paintings of Paul Nash, William Orpen and Luc-Albert Moreau are sickening. And then in the middle of the room, German artist Wilhelm Lehmbruck’s bronze ‘Fallen Man’, a figure left so utterly and overwhelmingly broken by war that it feels like his pain’s infecting you as you walk past. Facing his work are the twisting, cybernetic features of Jacob Epstein’s ‘Torso in Metal’ – the industrialisation of death made real, frozen in time. What a room. That shell-shocked disbelief in the face of death is followed by the tormented disfigurement of survival. Henry Tonks’s medical portraits of facial injuries feel like grotesque imaginings – they could be the work of Francis Bacon, maybe – but they are very, very real. Otto Dix, George Grosz and the incredible Heinrich Hoerle expose an inner reality of post war life in their drawings, the mental degradation of coming back from the front. There are wounded veterans, wide-eyed lunatics, forlorn prostitutes, weeping widows. It’s dark, frenzied. You can’t imagine the fractured, splintered art of this era happening if the hammer of WWI hadn’t shattered the world like it did. And then Dadaism fractured things even further with the collages of Hannah Höch and Kurt Schwitters, as did the surrealism of Max Ernst and André Masson. It’s society crumbling before your eyes. After that comes a calm that we now know was waiting for its storm: interwar art of a precise order and serenity, a gorgeous Meredith Frampton portrait, neat Paul Nash landscapes. But then the Tate decides we need to see paintings of workers, scenes of Parisian debauchery, they even think that it’s a good idea to start talking about the bloody birth of modernism with a Fernand Léger painting. It’s too ambitious, too broad, and should’ve just concentrated on WWI and its aftermath. As seems to happen a lot with big Tate Britain group shows, it’s like someone had a good idea and then five other curators, museum directors and marketing people got involved and tried to make it more ‘appealing’. If this had just been the opening four rooms it would have been staggering. Instead, it’s a show and a half, and it didn’t have to be. But if you zero-in on the opening rooms, it’s fantastic. And if you get close enough to the work, you can almost hear the anguished screams of history reverberating through the ages. It leaves you deeply aware that nothing has changed: this is still happening now. We are as in the wake of WWI – and all the wars before it and since – as at any time in history. This exhibition is as you’d expect not exactly cheery but it is fairly interesting. It covers all art following the end of the First World War. From rememberance statues around Europe, to medical drawings of wounded soldiers to the actual war artists drawing of the battlefields themselves. You won’t find many laughs but it is interesting to see how art evolved following the war and how even art that seems to not be about the war at all was in fact still war related. Some really great pieces of art on display but very few pieces that I’d actually want in my own home.